This weekend we head north for a pair of concepts starring the University of Alaska Anchorage. First up, Ben Shaffer shares a new home and road set for the Seawolves. Meanwhile, Chance Waddell chooses to go with a bold third jersey. Designed by different artists at different times, these three sweaters go remarkably well together and make for a fitting finale to our College Saturday miniseries. Next week, we're back to outdoor game concepts! How's this for a Freak Out Friday/Winter Classic crossover? Chance Waddell's Blues jersey was inspired by the old St. Louis Flyers. And I think the Caps one was too. 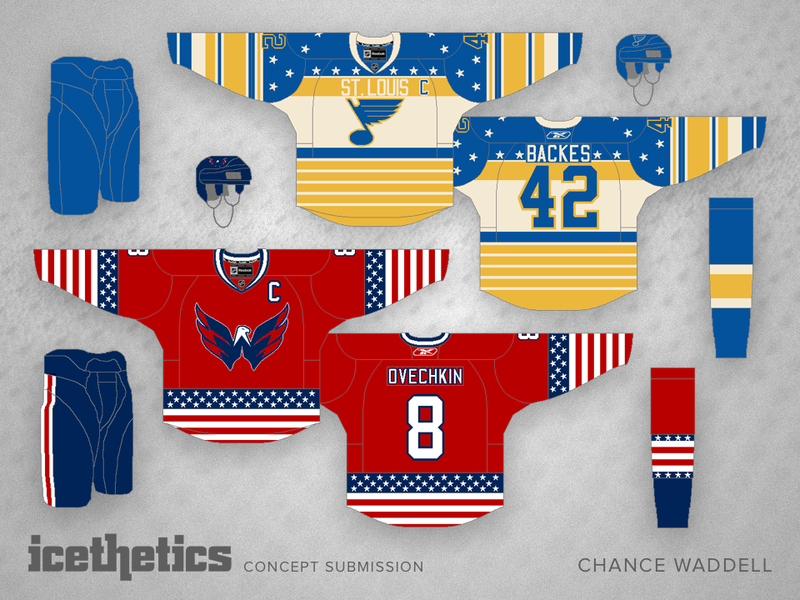 In fact, if you mix these two jerseys together, you pretty much get the St. Louis Flyers jersey exactly. What if the Blues traded their gold for silver? The result might look something like what Chance Waddell presents today. This set doesn't immediately make us think of the St. Louis club, but the more I look at it, the more I like it. How about you? 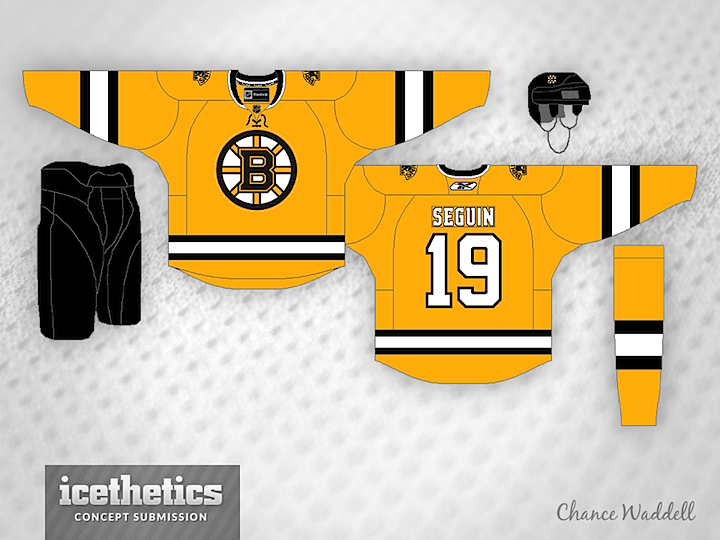 Game 3 of the Stanley Cup Final picks up tonight in Boston, so I got to thinking about how the Bruins could really use a new third jersey. A gold one. And I wasn't alone. 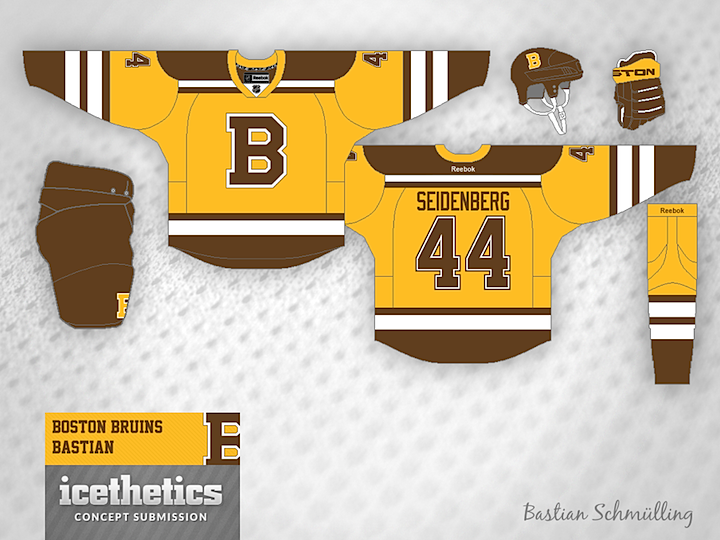 Bastian Schmülling had a similar idea and came up with this gold and brown number. What are we waiting for? Let's get this on the ice already! Failing that, Chance Waddell has this simpler idea that invites more gold and less of anything else. Face it, a gold jersey is in Boston's future. Just make it happen. Love it or hate it, this is the end of the Winter Classic series brought to you by the Waddell brothers, Chance and Jake. They created mock throwbacks for all 30 teams. And today, we wrap it all up with the Bruins and Flyers — opponents in the real NHL Winter Classic in 2010. With this sub-series complete, we have a handful of unique and varied Winter Classic concepts to come over the next few weeks. If you have an idea for a design, send it along!